Maggie Ball of Dragonfly Quilts will speak at the September meeting of Quilters United In Learning Together. Ball has been a quilter 25 years. She is the author of” Bargello Quilts with a Twist”, “Creative Quilting with Kids” and “Patchwork and Quilting with Kids”. A former resident of Fayetteville and member of QUILT, Ball now lives in Washington. Ball is known for her work with Mongolian quilters and the New Way Life NGO Mongolian Quilting Center. The Sept. 27 meeting will be at 7 p.m. meeting at St. Thomas Episcopal Church, 2898 S. 48th St. in Springdale. More information is available at quiltguildnwa.edublogs.org. In addition to speaking at the Thursday meeting, Ball will teach two workshops. On Sept. 28 the class topic is “Template Free Kaleidoscope Quilt Project” and the Sept. 29 workshop is “Bargello Quilts with a Twist”. Workshops are $35 each and will be held at Central United Methodist Church in Rogers. For more workshop information contact Therese Ramsey at therese.ramsey@gmail.com. 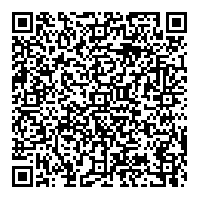 Scan this code for a map to the quilt show. O-Si-Yo is hello in Cherokee. The Cherokee National Holiday Quilt Show Committee members would like to invite you to spread the word about the quilt show that will be taking place during the Cherokee National Holiday (August 31-September 2, 2012) in the Old Gym at Sequoyah High School in Tahlequah, Oklahoma. All quilters are open to enter a quilt in the show and we would love to have you come and spend some time with us in Tahlequah for a fabulous Holiday celebration. Should you need further information, you may contact me at 918-453-5664 Monday-Friday 8 to 5 or at 918-316-3166 anytime. I am also available by eMail at pamella-wedding@cherokee.org.